In the month of October, Amazon is celebrating indie authors through its “Powered by Indie” promotion, and I am proud to be one of them. If you’re an author who wants to participate in this month’s activities, there’s also a Facebook page for you to visit. From time to time my traditionally published friends will ask me: why indie? Why not find a “real” publisher? Many years ago I wrote When a Grandchild Dies: What to Do, What to Say, How to Cope. For a year I queried publishers but found no one, other than a vanity press, who wanted to take on the project. Why? In part, there weren’t other books to compare it to. At the time I found just one book on grandparents’ grief, and it was out of print. Publishers like it when there are other books to compare with. I can’t blame them. Publishing is a tough business, and I understand and appreciate the need to make good business decisions. That said, I wanted grandparents’ grief to be recognized and appreciated. As I interviewed grandparents, the complexity of the topic surprised me. For some, it was the first time someone had really taken the time to hear their grief and pain. Indie publishing allowed me to bring a much-needed topic out into the world to the people who needed it in a timely manner, and the letters I received from grateful grandparents and their families made it all worthwhile. Switching to fiction has been more challenging. It’s not easy to find readers when so many people are doing what I’m doing. It’s hard to get heard above the noise, and I’m not comfortable making noise. However, indie publishing allows me to play with blending genres and to write exactly what I want. Yes, I work with an editor, and I try to produce quality work…but it may not be deemed “marketable” by traditional publishers. I have nothing against traditional publishing, and as they say, never say never. However, as long as indie publishing feels fulfilling and enjoyable, I’m proud to be an indie author! Nadine Galinsky Feldman is the author of contemporary (and soon historical) women’s fiction novels. Her debut novel, The Foreign Language of Friends, was a 2012 finalist in the Next Generation Indie Book Awards and a 2011 Gold Medal Winner in the eLit Book Awards. What She Knew, released in 2016, has received numerous favorable industry reviews and was named a finalist in the 2016 Next Generation Indie Book Awards. 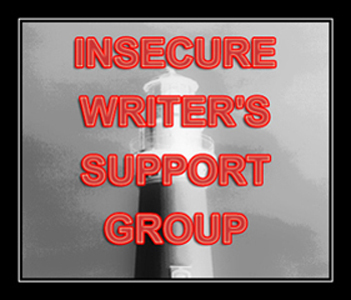 This is a week where two events collide: the First Wednesday post of the Insecure Writers Support Group, and the second of my three-part Badass series. They go together, I promise. On the first Wednesday of every month, the IWSG members post encouragement and support to other writers. Join us! And, special thanks to Alex J Cavenaugh, the founder and fearless leader of this group. Now, on to Badassery. Last week I posted Part I, in which I opined on Shonda Rhimes’ Year of Yes. This week, I feature another Badass: Elizabeth Gilbert. Are you feeling discouraged, confused, or disappointed with your writing career? 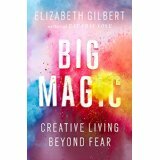 If so, I can offer you nothing better than Elizabeth Gilbert’s book Big Magic: Creative Living Beyond Fear. Big Magic isn’t a self-help book per se. Gilbert doesn’t offer a series of exercises, nor does she give you the secret keys to success. However, as she shares her own writing journey, you’ll learn from her. She calls Big Magic her “permission slip” to writers…the thing that says, “do it” when those sneaky, clever self-doubts threaten to upend our dreams. Most importantly, she puts our writing in perspective. Yes, it’s hard work, but so are other jobs. Yes, sometimes our writing is received more at other times than others. Yes, some days we don’t want to do it. But if we persist, we can find those moments of Big Magic. Filled with compassion, Big Magic also provides a gentle, but loving, kick in the pants. By demystifying and deromanticizing the creative process, Gilbert makes it easier for us to approach it. Best of all, Big Magic is beautifully written. After reading some books lately that weren’t so good, sitting down with Gilbert’s chatty, humorous, literary style felt like I’d walked into a fresh spring day. Reading it, I found myself nodding my head…a lot. I said yes, over and over. Sometimes she hit a nerve. I kept on reading because this book is pure pleasure to read. Gilbert has strong opinions, which is why I include her in the “badass” category. She doesn’t like it when we talk of our writing as though it’s our baby. After all, what if someone tells us our baby is ugly? She’s also not impressed by Hemingway’s counsel to “open a vein and bleed” on the page. We don’t have to suffer for our art…just apply regular practice and discipline to the process. In short, she sticks pins in the balloons of what we’re told as writers, those things that cause us to cut and run (or, as I’ve seen a lot of lately, to whine on Facebook instead of writing). I’ve no doubt I will turn to Big Magic over and over again when I need motivation. I hope you will, too. Nadine Galinsky Feldman is the author of The Foreign Language of Friends and the upcoming What She Knew, available March 2016. If you enjoy this blog, please consider purchasing a book or signing up for the newsletter to learn about upcoming promotions and giveaways.